The Book of Riga does much more than transport the reader to Latvia’s capital. Part of Comma Press’s ‘Reading the City’ series, which focuses not just on individual locations, but on urban themes, this collection examines both what has made the city the place it is today and what its future holds. 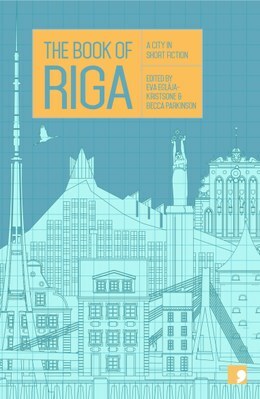 In fact, the dominant perspective through which these ten stories examine Riga is that of time. The opening story, ‘Westside Garden’ by Gundega Repse, explores the lives of two women living in the same house in the Kaiserwald forest: one growing up there in the mid-twentieth century, the other sharing her house in the present day. Between these two moments, of course, sits the Soviet occupation. The occupation also sits between two separate stories that share a specific location: Brīvības Street in central Riga. Andra Neiburga’s ‘Where Am I’ is an impressionistic sketch of middle-class life on the street at the beginning of the twentieth century; while at its end, Arno Jundze’s ‘Killing Mrs Cecīlija Bočs’ sees a nephew trying to benefit from his aunt’s newly reclaimed property – flats the Soviets had once nationalised. This story is a long complaint – the reader is sure the narrator will fail to inherit, despite his attempts to end his aunt’s life. In fact he is successful; his problem is that ‘I believed that if I had money then I’d finally start to feel like a person … But that feeling didn’t come, and still hasn’t’. The Soviets are gone; Latvian indepen-dence has been restored, yet free, autonomous life is oddly unsatisfying. This feeling is alluded to in another time-travelling tale, ‘The Girl Who Cut My Hair’ by Kristīne Želve. On the way to church with her friends – they seem to go not because they are pious; more because they now can – the narrator meets a girl with a ‘Soviet-produced man’s wristwatch’ on a blue ribbon. Ten years later, during which time the narrator has grown her short hair long – apparently in an attempt to regain her old life, ‘the way it was before’ – she meets the same girl in a hair salon, and ‘she turned from The Girl with a Watch on the Blue Ribbon into The Girl Who Cut My Hair’. The meaning of this tale is elliptical – the emphasis is on the time it took the narrator to grow her hair. So what exactly is she searching for? What kind of future does she want? Is it the hope and prosperity symbolised by ‘The Castle of Light’ – the shining new National Library building in Ilze Jansone’s searingly ironic ‘Wonderful New Latvia’. Or is it the claustrophobic suburbs of Dace Rukšāne’s ‘The Birds of Ķīpsala Island’ – the last story in the collection – which, to all intents and purposes could be located anywhere in the Western, capitalist world. Thus The Book of Riga ends as it starts, with a story of two women and one house. But the future is unclear. According to the second woman, the small semi-detached home, with neat lawns and nosy neighbours ‘has been waiting exactly for my children and me’. Is this because the previous occupant has painted it with birds ‘it will take half a lifetime to get to know’? Or is it because ‘most families in the West live in just the same way’. Riga, it seems, is at a crossroads, and its writers are imagining several futures.